At exactly this time 12 months ago, Rafael Nadal was the reigning World #1, on a 33-match winning streak on clay, and just one victory away from being the first person to claim all three clay Masters 1000 tournaments in a single season. Standing in his way was the written-off World #2 Roger Federer, who hadn’t won a title in close to eight months, and against whom he held a 9-1 record on clay. Of course, we all know what happened then. It kick-started the most unexpectedly wondrous 12 months for Federer and his fans, and the most unexpectedly frustrating 12 months for the guy at the other end of the net. Over the last few weeks, however, past form seems to have had no influence as Rafa reestablished his stranglehold over the clay season and Roger suffered a string of unexpected losses to players he would usually have beaten. 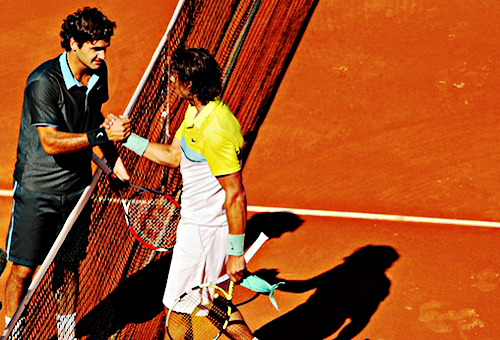 In some ways, the situation for this final is rather similar – Rafa is looking for glory, Roger is looking to make up for recent disappointments. What a difference a week makes, too. It almost seems like Roger takes perverse pleasure in proving time and time again to his doubters that he is not ‘done’; that when he suffered what some called one of the most embarrassing losses of his career against Montañes in the Estoril semis, it meant nothing for, once again, “he can pace himself and peak at just the right time,” as I said optimistically in my preview of the Estoril match. Arguably against expectations, he made it to the Madrid final after four encouraging matches featuring two blowouts and two epic tussles. And what of the match itself? Good old Rafa, humble though he may be, is going too far when he says, “[Roger] the top favorite in this tournament.” The Spaniard’s record on clay speaks for itself. It takes some very special play to beat him. Old news. Roger may be at a disadvantage with the Spanish crowd and having played two consecutive three-setters, though this could be cancelled out by the fact that this faster playing clay favors his gamestyle compared to other tournaments like Monte Carlo, Rome, and RG. Neither have been consistently on top form over the week – Federer, though making steady progress, lost the second set against Ferrer largely because his serve and backhand broke down just at the wrong moment, and Rafa played a horrendous (by his standards) first set against Almagro. For Roger to win he’ll have to have a huge serving day, much like he did in the first set against Ferrer, and have a good mental attitude; two components that have deserted him during other meetings with his rival. Rafa will probably just have to do what he normally does. Pummel Roger’s backhand, and generate unearthly amounts of topspin. This match could be a blowout, or an intense grapple for dominance. It could set the trend for the rest of the year, or it could end up being an anomaly. Whatever happens, millions of fans around the world will be watching, and because of the hype, the prestige, the legend, there is one thing I can be relatively sure about – tennis will probably win.